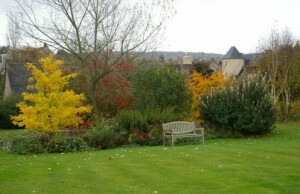 Normandy with its fantastic choice of gardens of all sizes and styles open to the public should be the no. 1 short break destination for the garden lover. This is just a small selection of our favourite gardens in Normandy that will provide you with a great day out and/or give you some inspiration for your own garden back home. Pop over the English Channel to Dieppe and head in the direction of Rouen. Take the A28 South for a few miles and there you will find le Neuborg and the Chateau du Champ de Bataille in Normandy. Despite the rather grim translation of the name to ‘Chateau of the battlefield’, the chateau and grounds are an impressive display of classic French style. The gardens had been all but abandoned until the present owner, Jacques Garcia, took on the project in 1992. 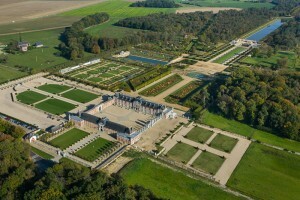 He has transformed the land into 43 hectares of lakes, terraces, follies, fountains and gardens in classic French style. The opening times vary according to the time of year. The Chateau is also open to the public and the tea rooms are well worth a visit. Stay at a B&B just 45 minutes away from where you can also make a day trip to visit the beautiful gardens at Giverny near Paris. If you are seeking inspiration for your own garden and have just a couple of hours to spare then you simply must visit the gardens of the Manoir de la Bonnerie. Located in an away-from-it-all setting near Sées just to the NE of Alençon, these gardens have been created over a period of just 12 years by the present owner. Sabine is a self-taught gardener and it is her passion that has driven the creation of the beautifully coordinated displays of both wild and cultivated plants. The collection brings together French, Italian as well as English styles, all set on a slope maximising the beautiful views down to the town of Essay. The potager and orchard are also beautiful creations and worthy of an hour or so of your time. The old manor house which dates back to the 15th century is itself a thing of beauty with its mullioned windows and defensive features. My recommendation is that you stay at this B&B 20 minutes away near Alençon. It is in an idyllic countryside setting and a great base from which to visit other Normandy gardens in the area. The world’s most complete collection of hydrangeas is a hidden jewel on the picturesque coast of Upper Normandy. 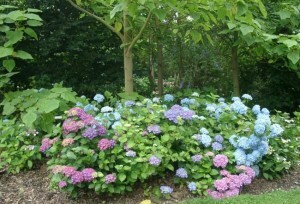 Shamrock, a garden dedicated to the study of the genus Hydrangea and was founded just outside the charming village of Varengeville sur mer, just along the coast from Dieppe, by Corinne and Robert Mallet. From June through to August, more than 700 species and cultivars of hydrangea provide a breathtaking tapestry of colour which has to be seen to be believed. It’s a shame the website for the gardens is so very, well, French. But at least it gives you the important information on opening dates and times. Use this B&B near Dieppe as a base for not only visiting the Hydrangea collection but also the British designed 12 hectares of gardens and parkland of le Bois des Moutiers nearby. These are open from the 15 March to the 15 November. 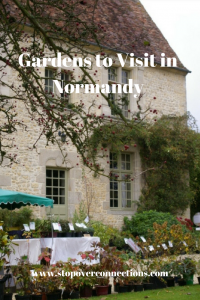 There are also numerous Normandy gardens on the Cotentin Peninsula which are well worth exploring and the French Gardens website is also a very useful resource for the garden lover who is visiting France.